Almost a year ago to the day, we reviewed Joe Danger's first touchscreen outing, and we were impressed enough to award the game a blistering score of 5 out of 5 - the very first of very few games to receive that accolade in 2013. Now Joe's back in a new adventure, but this time he's been shrunk down to the size of a toy, and set up against an extraordinary number of environments. 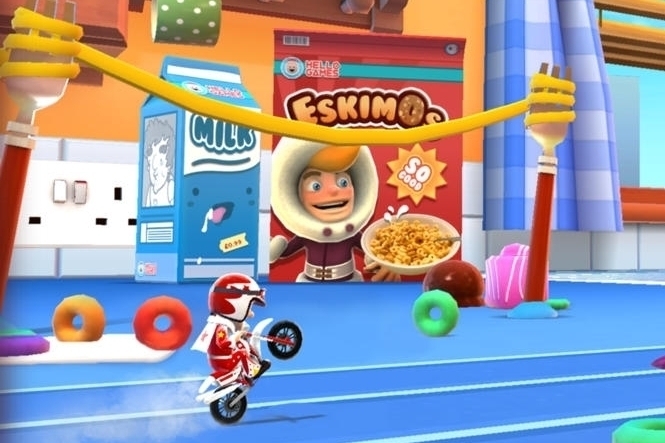 If you loved the first Joe Danger game, you'll be relieved to know that the precision controls and imaginative design that impressed so much the first time around have survived into the sequel intact. The delightful mixture of carefully timed taps, swipes, and loop-the-loops are all present and correct here, and there are even more bonus power-ups and vehicles to be unlocked in the pursuit of a new high score. The first Joe Danger game was a masterclass in the blending of goals - bonus scoring items would hover into view, allowing you to nab them just in time before they vanished, while crucially not forcing you to obscure the upcoming action with your hand. This time around the game asks just a little too much of you, too early on, and while the action's still satisfying the experience feels just a little too cluttered at times. Overall the gameplay's still superb, but what was once new and pristine now inevitably feels a little like old ground. If the above sounds harsh, consider that this is a game being compared to an original that was only just pushed off the number one spot in our Games of the Year round-up by one of the best games we played on all formats. Joe Danger Infinity may not be the touchscreen revolution that the first game was, but it's still a marvelous one nevertheless.